If the silhouette of this… baby casing (hee!) looks familiar, it’s because you’ve seen it before! 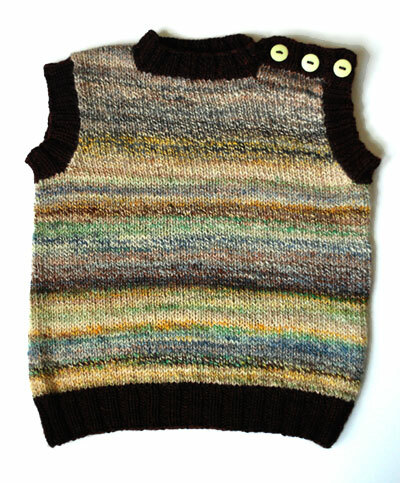 It’s basically the wee-est vest, except out of handspun and without colorwork. So cute! 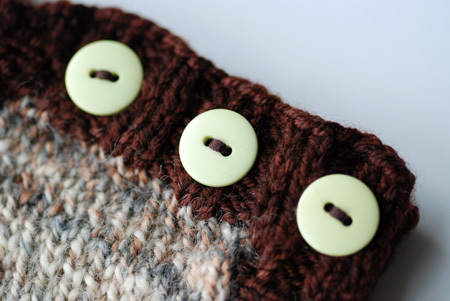 Pattern: based on the Archie Vest from Kristen Rengren’s Vintage Baby Knits (my review/preview here). Yarn: handspun superwash Bluefaced Leicester wool, approximately 210 yards. The fiber was dyed by Amy at Spunky Eclectic, and spun by my talented friend Stacie (see more handspun goodies in her Etsy shop). The colorway is called “Duck.” The contrast yarn is Malabrigo Sock, 100% superwash merino in Cordovan (810), held double. The Bluefaced Leicester is a beautiful, strong wool, but I’m not sure it’s next-to-the-skin soft for a baby. So it’s an added bonus that the contrasting Malabrigo Sock yarn, which is so soft and delicate, covers all the skin-touching edges. Needles and gauge: using size US 5 circs this yarn knit to about 5.5 stitches and 8.5 rounds per inch after blocking. Finished dimensions: 22″ chest circumference, 12.5″ from shoulder to hem. This is actually not so wee: should fit a 12-month-old baby, I think. As before, I knit the vest in the round until the armholes. And let me tell you, there’s nothing more pleasurable in this whole wide world than knitting handspun yarn, in utterly simplistic stockinette, on a circular needle, in the round. JOY is the only appropriate descriptor. Once again I added a button band along one of the shoulder seams to allow more room for the head. The light-light yellow/green buttons are from Windsor Button, of course. Now that I’ve completed two of these vests, I think I’ve also decided that the neck hole opening can be placed lower, so I’ll be sure to incorporate that in the future. I was really happy to be able to incorporate some of the bright yellow bits of this yarn into the vest, albeit into the back ;). Love this vest! So very cute 🙂 Your use of handspun is always great. I like how grown-up the color scheme is and the dark edging is a great contrast. Love it. Very mature colouring for a baby, and lovely to hear of your delight in knitting it. Hooray! It looks fantastic. 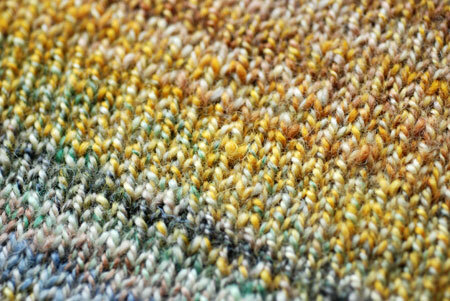 You continue to find the *perfect* patterns for highlighting handspun. such a great colorway! how lucky you are to have such talented friends (and what a lucky baby who gets to wear this)! I bet someone will look super cute in it!!! But I have a question which I am sure you will receive in the spirit of technical curiosity with which it is posed–in the photo it looks as if there might be a very slight bias to the fabric, and I’m wondering whether this is (a) an illusion; (b) just the way it’s arranged; (c) an artifact of blocking; or (d) the result of a slight twist artifact in the handspun. 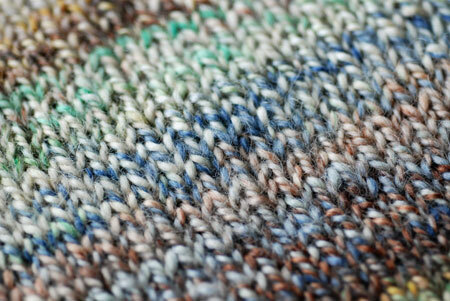 Did you detect any twist or bias in the yarn as you were knitting? I ask because I have been spinning for a sweater and I’m trying to gather information about bias (since I think I’ve got some…). I’d be glad of your insights! I love knitting with handspun. I just used a tiny bit of it for the yoke of the Cerise Baby Sweater. Your vest looks fabulous. I love the colors, and the contrast. 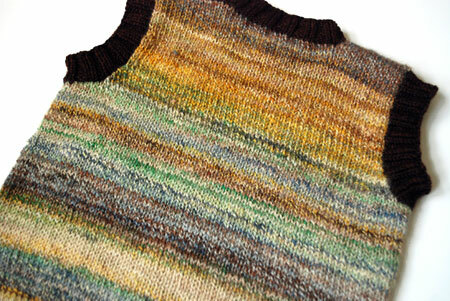 what a great way to use up handspun…. I do have some superwash bfl that I haven’t spun yet…. Very cute. These are going to be some well garbed babes! Ok so the brown trim on that little beauty is AWESOME, sister! Loving the look of the handspun, truly lovely.